Due to Easter holidays, we won't be answering any new emails until the 23rd of April. Do not worry, if you had a problem with registration before or during these days, and for some reason could not complete the payment/registration, we will respect the early registration fee. Please, bear with us and be patient while we sort the pending emails. 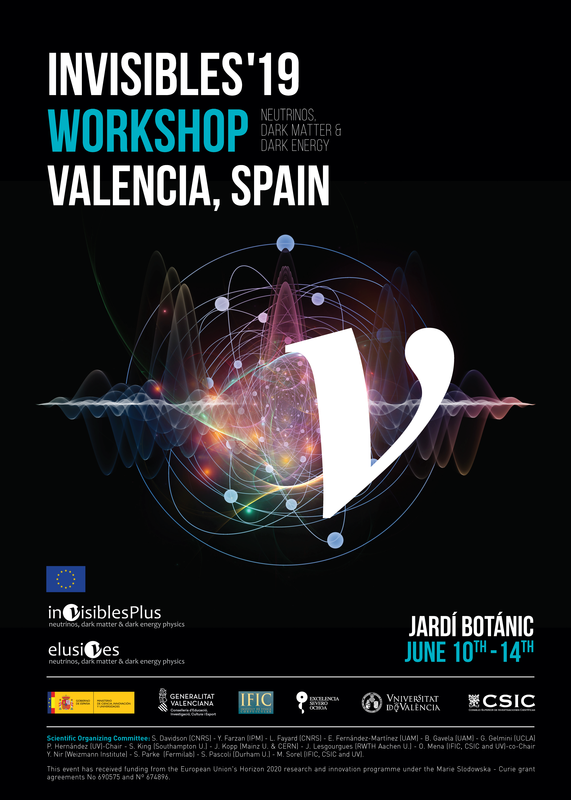 The Invisibles19 Workshop will take place at the Botanical Garden of the University of Valencia from June 10th to June 14th 2019. The associated Invisibles19 School, will take place the week before from June 3rd to June 7th at the Laboratorio Subterráneo de Canfranc in Huesca, Spain. Invisibles in astrophysics and cosmology: dark matter searches, black holes, gravitational waves and the origin of Cosmic Rays. The Invisibles19 Workshop is organised in the context of the Horizon 2020 funded projects ELUSIVES (674896-ELUSIVES-H2020-MSCA-ITN-2015) and InvisiblesPlus (690575-InvisiblesPlus-H2020-MSCA-RISE-2015), which focus on Neutrinos, Dark Matter and Dark energy and their connection, with emphasis on the role of the symmetry relating matter and antimatter. It is the eighth thematic workshop in the series initiated in connection with the past ITN project INVISIBLES.